The country opens a new front in its battle against non-Muslim celebrations. Brunei has imposed strict restrictions on Chinese New Year performances as part of an incremental crackdown against non-Muslim cultural and religious events in the country, local media outlets confirmed earlier this week. A letter widely circulated around social media says that lion dances – a traditional Chinese dance where performers imitate a lion’s movements in a costume to commemorate various occasions including Chinese New Year – can only be performed for a limited number of hours on just three days –February 19 to 21 – and only on three premises – the temple, school halls, and Chinese homes. Performances at all commercial establishments and public areas are strictly prohibited. The Ministry of Home Affairs subsequently confirmed that the contents of the letter are accurate. Since Chinese New Year celebrations, including lion dances, usually go on for an extended period and are often public and festive, these regulations have been read to be extremely restrictive. Neighboring Malaysia and Indonesia for instance – both also Muslim-majority countries with Chinese minorities – are much more moderate on this score and no such curbs are in place. While the extent of the crackdown is rather alarming, the move itself is not altogether surprising. 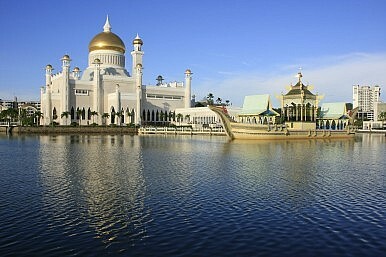 As I have written before in these pages, Brunei, a tiny, oil-rich country with a population of just around 420,000 people, two-thirds of whom are Malay-Muslim, is no stranger to religious restrictions. This has only worsened following the implementation of a strict new penal code in May 2014, which curbed various forms of religious expression including teaching, proselytism and religious publishing. Some were initially unsure about the extent to which these regulations would be implemented. But last December, the government launched a similar crackdown against Christmas decorations, which The Diplomat covered here and here. At the time, some had suspected that this would be extended to include other non-Muslim celebrations in 2015, including Chinese New Year. The reasons behind the restrictions are also clear. Just a few days before the new rules were disclosed, imams warned in a Friday sermon that celebrations that were unrelated to Islam could “entice” Muslims to participate, leading them to commit tasyabbuh (imitation) and damage their aqidah (faith). The practice of tasyabbuh or imitation by Muslims – which the sermon says can include seemingly “casual” acts like taking part in a lion dance show, wearing a Santa Claus outfit, and decorating homes with images or symbols not in line with Islamic teachings – can be interpreted as an offense under Section 207 (1) of the penal code, which is punishable by a fine of up to $20,000 and an imprisonment of up to five years, or both. Indeed, this was clearly stated in the government statement released last year during Brunei’s ‘war on Christmas. Likewise, Chinese who ignore the restrictions on Chinese New Year festivities can be seen to be violating Section 209 (1) of the penal code – previously publicized as well last Christmas – that allows non-Muslims to celebrate their religious festivities only among their community and forbids them from disclosing or displaying them publicly to Muslims. As The Diplomat reported previously, similar curbs introduced during Christmas last year led to discontent among some Bruneians, including Muslims who argued that their faith was strong enough to resist the temptations of a Christmas tree and that further religious restrictions may damage the country’s international reputation. These new regulations are likely to elicit the same reactions.